The Lotus Exige Sport 380 may feature the same engine as a Toyota Camry, but thanks to its lightweight design it is quicker than many cars with much more horsepower. Lotus likes to take the David role in David and Goliath battles and they are taking the battle to the track. The Lotus Exige Race 380 makes the featherweight Sport 380 look like its fat uncle. 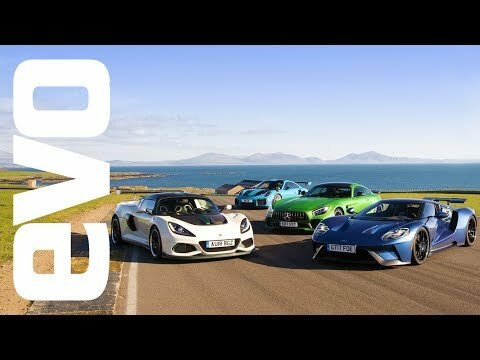 The racing version of the 380 is able to lap the Hethel track 1.5 seconds faster than the quick Exige Cup R.
The Lotus Exige Sport 380 is the British automaker’s last car to debut in 2016. The company has always been based on the idea of adding lightness, but a bit of extra horsepower is not necessarily a bad thing. In fact the Exige Sport 380 gets 375 horsepower from a 3.5-liter supercharged V6 sitting right where God intended it, the middle of the vehicle. That power by today’s high standards isn’t bad, but doesn’t impress too much. That is until you realize that the car weighs just 2,345 lbs. Think about it as putting a little more power than the base Porsche 911 Carrera in a car that weighs a bit less than a Mazda MX-5. The new Lotus Exige Sport 350 looks like it will compete well with the Porsche Cayman GT4 from a performance stand point. Where the GT4 provides a higher top speed and more luxury, the Exige Sport 350 offers a much quicker and even more focused ride. As is usual with a Lotus the weight is about the same as a postage stamp which allows it to do more with less power. They are also one of the few companies that asks if each piece of the car is necessary and if it isn’t they usually get rid of it.